Flex 4.6 is Available AND I’m on TV! In case you had not seen on the Flex team blog, twitter or through some other medium, Flex SDK 4.6 and Flash Builder 4.6 were released today! Go get them, if you have not done so already. Flex 4.6 marks a huge advancement for the Flex SDK, especially regarding mobile applications. A lot is included in this update, so much so that we couldn’t deliver it in the Adobe Application Manager. This means Flash Builder 4.5 users won’t automatically be notified about the update and will have to download the full Flash Builder 4.6 installer and enter their Flash Builder 4.5 serial number. You can download the open source Flex SDK at: http://opensource.adobe.com/wiki/display/flexsdk/Download+Flex+4.6. Note: you must uninstall Flash Builder 4.5.1 to install Flash Builder 4.6. 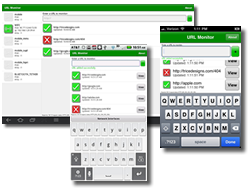 This includes my URL Monitor application, available for iOS, Android, and BlackBerry, developed using Adobe AIR. The URL Monitor tool is a simple diagnostic application that will allow you to quickly and easily monitor the status of various URL endpoints. Simply enter a URL into the text box and add it to the list. A polling HTTP request will be made every 10 seconds to determine the availability of a given endpoint. HTTP codes 200, 202, 204, 205 and 206 will be identified as a success with a green check. All other HTTP codes will indicate a problem as a red ‘X’. The Flex Mobile Serialization Testing application is a basic scenario for testing performance between AMF and JSON in a Flex application. The mobile app makes requests of simple data objects from a ColdFusion CFC. In each test iteration, a request is made for 1, 10, 100, 1000, and 10000 value objects, in both AMF and JSON formats. The total round trip time from request to deserialization is measured and compared for each case, for a total of 5 iterations through each cycle. The application displays end-to-end performance metrics for both AMF and JSON requests. The Enterprise Tablet Visualization application is a sample application built using Adobe Flex and AIR. The application is not a production application. It demonstrates realtime data push to a mobile application using LiveCycle Data Services, realtime multimedia collaboration using LiveCycle Collaboration Services, as well as multi-form-factor UI for both tablet and phone devices, including map integration and interactive data visualizations. Very often I see an argument against Adobe technology claiming that Adobe isn’t “open” or is based on “closed” technology. This is far from the the truth, and I’d like to highlight some of Adobe’s involvement in open source initiatives and open standards. First, let’s focus on Webkit, the open source web browser engine used in Chrome, Safari, iOS, BlackBerry, Android, and other systems… Adobe has contributed code for both CSS Shaders and CSS Regions to webkit (among others), and is taking steps to become a more active contributor to the webkit browser engine. CSS Shaders will enable rich & high quality visual effects within HTML-based content. Check out the video below to get a better idea of what will be possible with CSS Shaders. CSS Regions will enable rich, non-rectangular layout, with overflow between region containers. Imagine text wrapping area of an image (not based on the bounding rectangle), or text flowing between containers in a non-linear fashion. CSS Regions will enable significantly richer layout in content across the web. Check out the next video to see CSS Regions in action. You can view the W3C spec for CSS Regions at http://lists.w3.org/Archives/Public/www-archive/2011Mar/att-0011/CSS_Regions.pdf, download CSS Regions code from Adobe Labs, or learn more about CSS Regions on the Adobe Developer Connection. PhoneGap is “an HTML5 app platform that allows you to author native applications with web technologies and get access to APIs and app stores.” PhoneGap has always been open source. Adobe acquired Nitobi, the creators of PhoneGap, and with that acquisition the PhoneGap project was submitted to the Apache Software Foundation as Apache Callback. The CQ content management system not only is built on top of open source software, but the development team also contributes back to open source in many projects, and is deeply involved with the Apache Software Foundation. In addition to driving industry standards, Day Software has been a leading force in the open source community. Day Software’s Roy Fielding was co-founder of the Apache Software Foundation, author of the Apache Software license, and creator of the Apache web server. Day’s R&D team are strong contributors to the open source world, with a development model based on building true open source communities around key technology advancements that originate in Day R&D through the sponsorship of new projects via the Apache Software Foundation. Top-level projects such as Apache Jackrabbit (the reference implementation of the JSR-170 standard), Apache Sling (an industry-first REST-based web application development framework), and Apache Felix (an OSGi R4 Service Platform implementation) are examples of Day’s unique commitment to open source. In total, Day Software contributes to over 12 Apache projects and 25 open source projects. www.ohloh.org, an independent website that tracks open source contributions, shows that over 75% of Day engineers are active committers to open source projects, with over 75% of those engineers being ranked in the top 1% of open source developers worldwide. Flex has been open source and available since version 3.0 (around 2009 I think). Recently, it was announced that Flex will be contributed towards an open source software foundation. This move will give the Flex framework direction and tooling to the community for further management and development. Be sure to read the official statement and FAQ for further detail. As of November 2011, Adobe is in the process of preparing two proposals for incubating Flex SDK and BlazeDS at the Apache Software Foundation. Complete, but yet-to-be-released, Spark components, including ViewStack, Accordion, DateField, DateChooser and an enhanced DataGrid. BlazeDS, the server-based Java remoting and web messaging technology that enables developers to easily connect to back-end distributed data and push data in real-time to Flex applications. Adobe will also have a team of Flex SDK engineers contributing to those new Apache projects as their full-time responsibility. Adobe has in-development work already started, including additional Spark-based components. Open @ Adobe is another collection of open source projects that are contributed by Adobe. This contains OSMF (Open Source Media Framework), FlexPMD (code coverage), CSS Regions, CSS Shaders, the Text Layout Framework (TLF), Flex Unit, and many others. Be sure to also check out the Open @ Adobe blog. RIAForge is an open source online community sponsored by Adobe, and developed/maintained by fellow evangelist Raymond Camden. RIAForge hosts over 1225 active open source projects, with over 19 million project page views, and with each project you get a blog, issue tracker, subversion hosting, forums, and statistics. Of course, don’t forget opensource.adobe.com, where you can read about additional open source projects at Adobe. This is not meant to be a definitive list, and it doesn’t even touch on the subject of open file formats or protocols. If you didn’t already, be sure to check out the Open @ Adobe blog. Get ready for 360|Flex 2012! What better place to network and learn the latest about Flex development for mobile, the desktop, and the browser? 360|Flex is a chance to interact with the community and even get involved in the open-source Apache Flex project. The 360|Flex 2012 schedule is now available, and it’s loaded with great presentations from leaders in the Flex community. I’m excited to have been chosen for 360|Flex this year, focusing on Multi-Device Best Practices. Ready to bring the “write once, run everywhere” dream to a wonderful reality? In this session we will focus on multi-device deployment considerations and best practices to help bring your applications to as many platforms, devices, and form factors as possible. Adobe reaffirmed its commitment to the Adobe Flash Player in desktop browsers, and its role of enabling functionality on the web that is not otherwise possible. Flash Player 11 for PC browsers just introduced dozens of new features, including hardware accelerated 3D graphics for console-quality gaming and premium HD video with content protection. Adobe reaffirmed its commitment to Adobe AIR for mobile devices, which allows developers and designers to create standalone applications using Adobe Flash technologies that can be deployed across mobile operating systems, including Apple iOS, Google Android and RIM BlackBerry Tablet OS. Adobe reconfirmed its commitment for its continued support for Adobe AIR applications running on the desktop. Adobe is actively working on the next version of Adobe AIR for the desktop. Adobe announced its intention to contribute the Adobe Flex SDK open source project to the Apache Software Foundation for future governance.